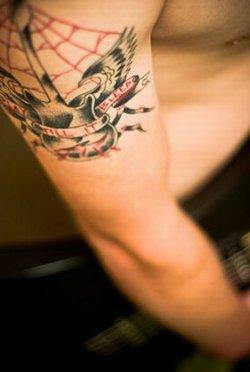 Guitar tattoos are well loved by rock and rollers and maybe a little less so by country music enthusiasts. 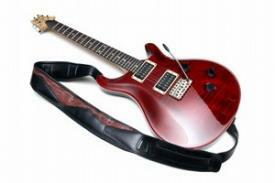 See which type of designs are popular in this genre and even learn about tattoos for your guitar! If you love music and tattoos, you've probably at least contemplated getting a guitar tat if you don't already have one. In fact, there are plenty of musicians covered in body ink, and there are some classic guitar designs among them. You can choose your favorite, whether it's a standard acoustic, an electric model, the ever-popular bass or the lesser seen double neck guitar. Most tattoos hold some kind of meaning for the people that wear them, and guitar tattoos are no exception. To some people, these designs are all about a love of music, both melodies and lyrics. To other people, a guitar tat is a symbol of rebellion or a rejection of society's norms. Still others look at guitar tats as symbols of freedom and life lived on the open road. The style of the guitar and the accompanying artwork does a lot to convey these individual meanings. For example, an acoustic guitar flanked by flowers has a lighter feeling that is more akin with Willie Nelson in his The style of the guitar and the accompanying artwork does a lot to convey these individual meanings. For example, an acoustic guitar flanked by flowers has a lighter feeling that is more akin with Willie Nelson in his On the Road Again days. On the other hand, a flying V electric guitar being played by a skeleton using a snake for a strap is definitely about taking a walk on the darker side of life. Believe it or not, you and your guitar can both have tattoos. No, we're not talking about any type of engraving or stamping that might ruin the finish on your guitar and affect its sound. These guitar tattoos are actually cling decals that can be added and removed from your instrument anytime you like. Designs vary from floral motifs to flames and even popular tribal designs. Prices vary from one vender to the next, but these tattoo decals are usually sold in coordinating sets. You can find them at the following website, although your local music store may carry them as well. GuitarTattoos.com: This site carries Slikz™ designs licensed for use from Tattoo Johnny. So, are you an electric guitar kind of person, kind of edgy and restless? Maybe you're more of an acoustic personality, kind of laid back with a "take life as it comes" attitude. You'll need to decide this first in order to get a clear idea of the type of tattoo you want. It may seem cliché because you see so many of them, but electric guitars and flames just seem to go together. Maybe it has something to do with those "hot" licks laid down by the likes of Eddie Van Halen or Eric Clapton. You can flames to the finish of your guitar or have the flames blazing up around it. If you like the skeleton tat previously described, you might even want to add tiny flames around where his finger tips meet the strings. Using musical notes, measures and/or lyrics from one of your favorite tunes can really add flavor to a basic guitar design. The kind of music you select will naturally lend itself to either an acoustic or electric instrument. For example, the opening riff to Jimi Hendrix' Purple Haze is better suited to an electric guitar, while a song like the Beatles' Hide Your Love Away fits the softer vibe of an acoustic. Speaking of the Beatles, what about a few lyrics from Revolution paired up with John Lennon's classic Rickenbacker? Adding roses and other floral accents to any type of guitar tat lends the design a more feminine feel. That's not to say it makes the tat wimpy. On the contrary, a few thorny roses backing an electric cutout guitar is definitely rocker chick territory. This design might not be the first that jumps to your mind, but think about it for a moment. Picture a bunch of cowboys sitting around the campfire at night, strumming along to tunes like Red River Valley and She'll Be Comin' Around the Mountain. Guitars go well with all kinds of cowboy tattoo themes, including steer horns, bucking broncos and broad rimmed hats. This type of tattoo would definitely be more aligned with an acoustic guitar. For something radically different, try adding tribal flavor to your design. You can get a tribal rendering of an electric guitar from any tattoo artist versed in this genre, or you can choose to anchor the center of a tribal band with a sharp looking electric guitar. The design examples above are just few out of many. If you're still looking for inspiration for an original design, check out Tattoo Johnny. This website has quite a few pages worth of guitar designs, and if you happen to see something you really like, you can order and download a temporary tat to give it a test ride. You might decide you like the design just the way it is, but it would be even better to take it to a local shop and let an artist customize the design just for you.